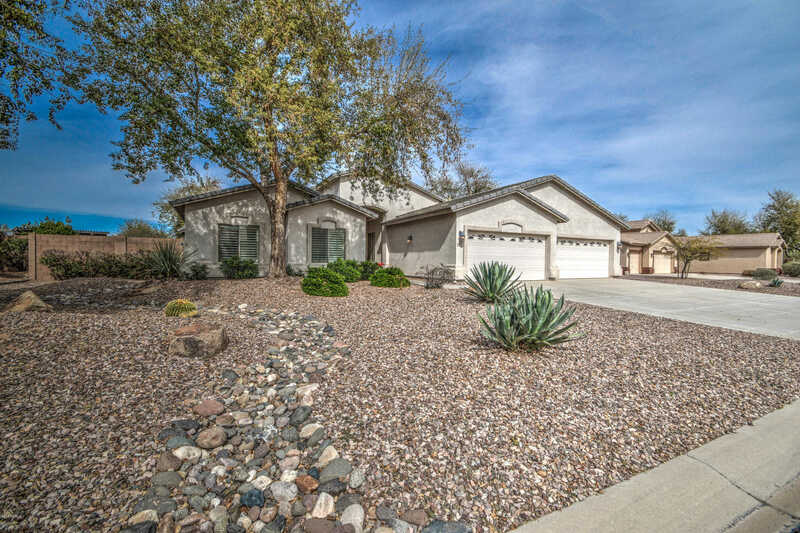 Highly sought after and scarce single-level split floor plan with 4 bedrooms + den, 2.5 baths and DREAM 4 CAR GARAGE in desirable gated community of Rancho Gabriela. This home has all the right touches including 2”x6” construction! An entertainer’s dream – the kitchen features rich 42” Cherry cabinets, double ovens and kitchen island open to the Family Room-posh wood shutters, soaring ceilings – gorgeous hardwood floors, 12”x12” tile and upgraded carpet in all the right places. 4-CAR GARAGE features 4′ EXTENSION, epoxy floor, laundry sink and lots of cabinets! Double AND Single gate for easy backyard access. Master suite features spacious bathroom with executive height cabinets, roomy garden tub and incredible walk-in closet! Private pool, covered patio and huge lot! Directions: head west on Cactus. Turn south (left) on Bullard. Turn West (right) on Cholla. Left on 148th ave. Through gate (use code) Right on 150th lane. 2nd home on the right. Approximate size: 16540.00 sq. ft.